I’m sharing a super easy and cute fall craft today…how to make a book page pumpkin! I am just loving all of the ways people out in blogland that people are using Dollar Tree pumpkins! I shared with you a couple of weeks ago my first use of a Dollar Tree pumpkin, my Monogramed Pumpkin. I love projects using book pages. As a literature teacher they speak to me through the beauty of the typography and their simplicity. I knew when I saw some variations of the book page pumpkin on Pinterest, I had to make me a few, and they truly couldn’t be easier! In fact I think the hardest part was bringing myself to tear the pages out of a book! I have a confession as well, I had a hard time even choosing a book knowing I was going to tear it apart. In fact my favorite style of pages (because of the typography and page color) was Al Gore’s Nobel Peace Prize Speech. First I had to think about the fact that someone’s Nobel Peace Prize Speech was now residing in an aisle at the Dollar Tree among plastic toy guns and Lady Guadalupe incense. Then I had to decide if I could bear to tear apart the pages of said person’s Nobel Peace Prize speech…regardless of how I felt on a personal level about said person. I was having a real mental and ethical crisis right there among the crossword puzzles and the cheap coloring books with those weird princesses on the covers. So I chose a different book…and I’m hoping the author of that book doesn’t read this blog, or I’ll feel guilty all over again. Step 1. Tear pages from your book and then tear into 1/2” to 1” strips. Avoid pages with lots of blank spaces so that you can get a uniform look of typography on the pumpkin. Step 2. Working in sections, so that your glue does not dry to quickly, spread mod podge onto your pumpkin and apply book page strips overlapping to avoid orange showing through. Glue all the way up the pumpkin but not onto the stem. Step 3. As you are applying strips of paper smooth out the strips as you work making sure to avoid as many wrinkles as possible for a nice smooth finish. Run your finger down through the ridges of the pumpkin to make sure they are still defined. Step 4. Apply plenty of glue to the bottom of the pumpkin and smooth down ends of strips for a nice finish. Apply a thin layer of mod podge over entire pumpkin and allow to dry completely. Step 5. Cut off excess paper around top of stem. Find a nice stick or twig that you like and cut or break to size. Poke stick down into stem of pumpkin. Apply mod podge or glue around base of twig and add Spanish moss or decorative grass around base of twig. And that’s all there is to it! Easy-pumpkin-Peasy! Here’s some more fun pumpkin projects! 72 Comments on "How to make a book page pumpkin"
Oh how lovely! I’ll be adding this project to my to do list ASAP! The Dollar Tree goes chic! Who would have thunk it? We don’t have dollar stores in our area, so I definitely need to head over to a town that has one and shop! I love this idea, Heather !! And, am thinking I just might have to borrow this. They look fabulous … thanks for the wonderful tutorial! That is such a sweet pumpkin, Heather…can’t wait to see 2 & 3!! That pumpkin craft is a great one! I saw one similar on Debbie Doos blog. I like how you added a little bit of moss on top. Loves it Heather! I had so much fun doing my vintage kitchen recipe one..I just want to keep it out all year round. Thanks for making me laugh as well as for the great idea on the book page pumpkins. I’m headed to Dollar Tree tomorrow…for the pumpkins. I think I’ll leave the mentioned book right where it is sitting :). I love them, super cute! I have some old sheet music that would work just perfectly! Thanks. How cute! I keep saying I’m done with fall decorating and then you see a cute little pumpkin like this. I may just have to borrow your idea. This looks FANTASTIC!! 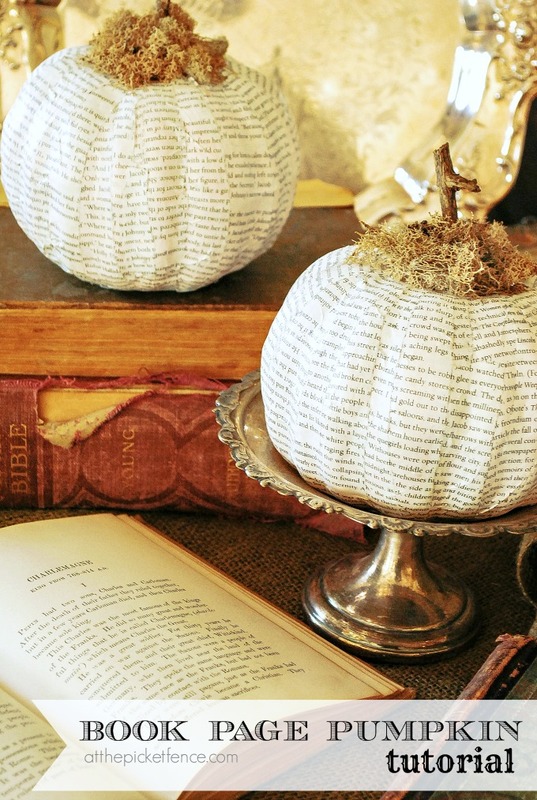 I’m heading to Dollar Tree tomorrow-must make some of these adorable decoupaged pumpkins! Thanks for sharing!! Love it sitting on the silver! This is so stinkin’ cute I can hardly stand it. Great post! Very pretty! I think I’ll give it a try! Thanks for the inspiration! Swoon! This is a wonderful fall project. Your pumpkin is chic and very well read! HA-HA! That has got to be the cutest punkin thing i’ve seen so far… I am totally off to the dollar store tomorrow! These are fantastic, guess its back to the Dollar Store tomorrow. Thanks for sharing. I love the way these turned out, Heather! I’ve been wanting to try this technique with fabric. I have so much fabric – samples and scraps that would be perfect for something like this. So, I have made a half dozen trips to our local Dollar Tree, and there is not a pumpkin to be found there. Seriously. I’m getting ready to picket the place. IF I find some cheap pumpkins, I am dying to do some creative stuff. This one was up my alley from the first photo. I just love words, you know. That really is adorable! I love all the fun stuff you can do with book pages! So very lovely and such a fun craft! Aren’t you clever. I would have a tough time ripping up a book too. I love how it looks. I have to do something like this. Too cute. Oooh, nice idea, Heather. It’s lovely! Book pages have a certain gorgeousness all of their own, don’t they? I think they go perfectly with this time of year – echoes of rustling leaves. Thank you for linking up to Modern Country Style’s Fall In Love link party! This is the neatest Book-Page Pumpkin I have ever seen. Great job done! That dollar store pumpkin looks so much better! Good job!!! What a cute and adorable idea. I’m going to go shopping this weekend to the Dollar Store. Your pumpkins look so elegant and different than all the pumpkins I see. Thanks for sharing. Really cute idea! I have a sack of dollar store pumpkins, but I’ve not been able to do much this week. Heather they are so pretty and I love the silver that they are on and I am glad that you found some pages to use. 🙂 Your photos are gorgeous, love the vignette. Great tutorial, Heather, on this super-cute idea! Love it! I really love these — especially the moss on top and the twig — perfect touches! I SO need to try this — thanks for the tutorial! WOW, I think I can actually do this. Love it. Happy to be a new follower from vintage inspiration Friday.